Really? I sat forward in my seat. 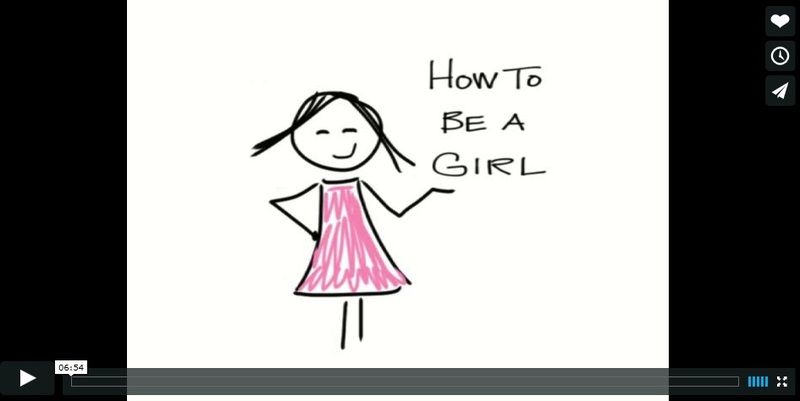 As the mother of a young transgender child, this sounded like information I needed to know! I read through the article once, then once again, eager to learn more. Just what were these studies? And what else might they suggest? Perhaps they’d have some helpful suggestions for me, as I attempt to parent a child whose identity defies everything I have ever been taught about gender, thrusting us both into a situation that is mentioned exactly never in the parenting books. By golly, I said to myself, I need to get my mitts on those studies! Hey, New York Times: Really?! As Ms. Hartocollis acknowledged, we are currently living in “a transgender moment.” And smack-dab in the middle of that moment are children like mine – the first generation of kids to be allowed to live in a different gender from a very early age (mine transitioned at age four). Parents like me are highly “controversial.” The public debate over whether we’re saving or scarring our children is a hot one. And believe me, in private, our doubts and fears and unanswered questions keep us up at night. When my child first started telling me that she wasn’t the boy I had assumed she was, I went searching for the kind of studies referenced by Ms. Hartocollis. I’m a modern mom: I wanted more than suggestions; I wanted data. The internet provided me with a wealth of similarly uncited claims: Most kids like mine would change their minds, I read. I kept coming across the assertion that 80 percent of kids like mine would end up NOT being transgender. Armed with this dubious data, I proceeded to doubt and question my child for a long and miserable year, ignoring her pleas and pronouncements until she gave up on me and started to retreat into a place no young child should go. When I relented and allowed her to begin living as a (blissfully happy) girl, the 80 percent statistic was thrown in my face by those accusing me of rash and irresponsible parenting. It was time to get to the bottom of this. Where exactly did this number come from? What were these studies that had suggested it in the first place? Did they actually exist, and were they reliable and scientific, or was it the case of a “truth” that’s been repeated so many times, and cited by so many people (including journalists) with fancy credentials, that no one bothers to question it anymore? 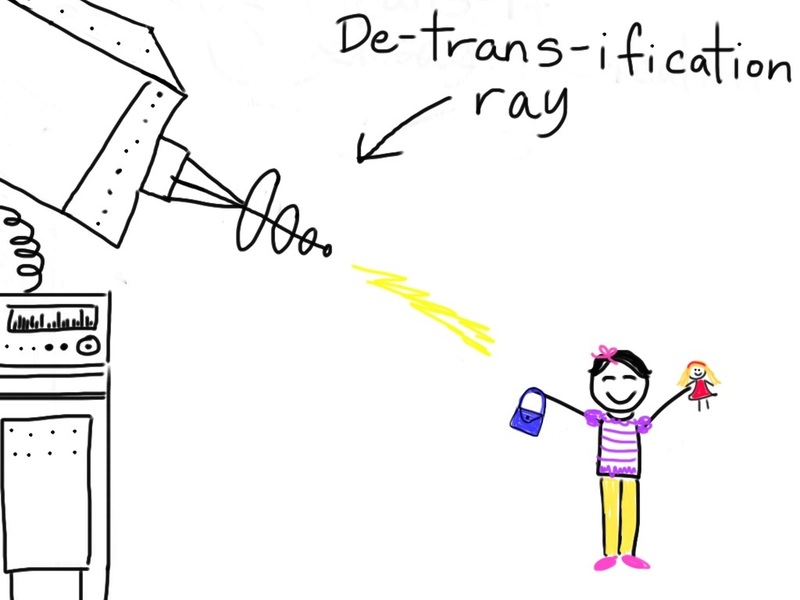 To hear the story of my search for THE FACTS about kids like mine, check out the latest episode of my podcast, or (if you only have four minutes and you like cartoons), watch the slightly snarky animated version. Click on this image to watch snarky cartoon. “Report of the American Psychiatric Association Task Force on Treatment of Gender Identity Disorder,” Archives of Sexual Behavior (vol. 41, August 2012). 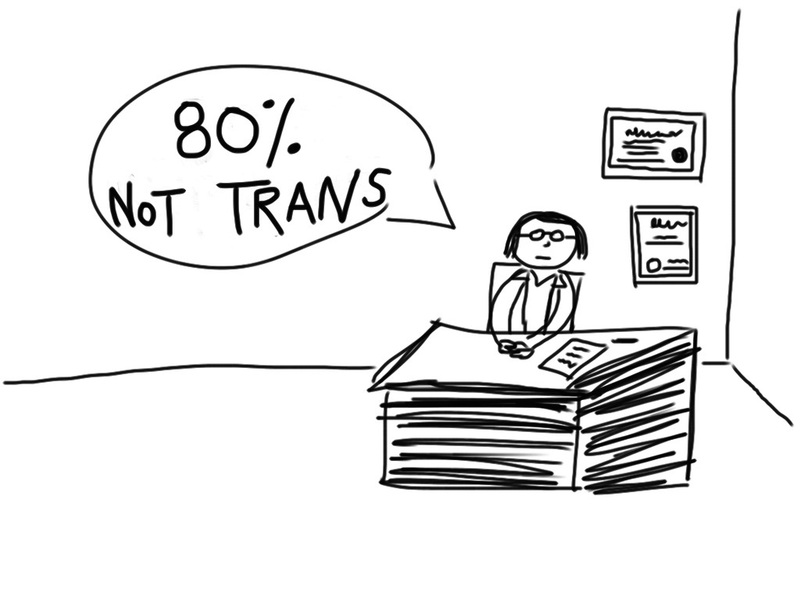 Even if it were true that 80% of kids with gender dysphoria end up not being transgender, that means that 20% ARE. 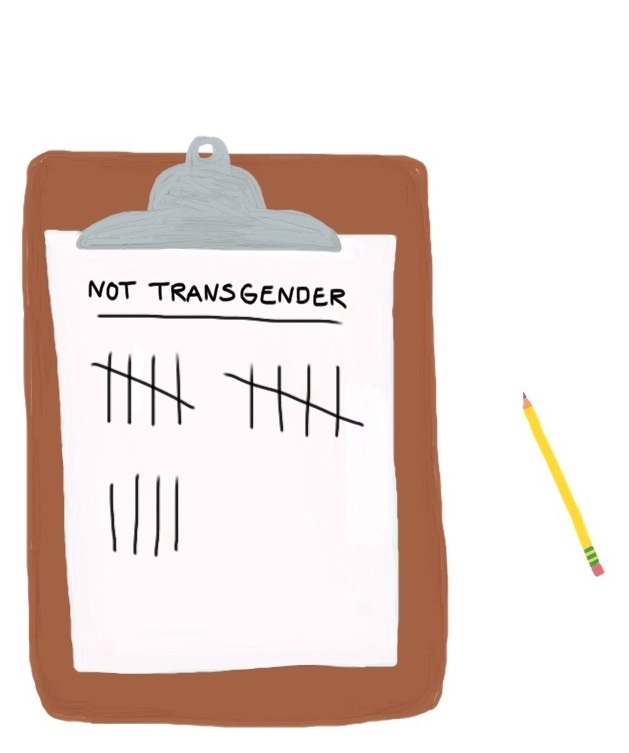 It’s not that 80% of your kid is experimenting with gender and 20% is trans! Even if the study did exist there is no guarantee they would be accurate, the sad truth is that even a majority of doctors and therapists have ‘Transphobic’ views on the subject and have been known to colour their diagnosis. A friend of mine other here in the uk got into a bad situation when a doctor at her local clinic refused to give her hormone treatments after the specialists in London had told her to start them, eventually they found out he was transphobic and she got a new GP. I don’t know if you have ever watched the PBS program Frontline, but I’ve seen many of their episodes and found them to be well researched and unbiased about a wide range of hard-hitting topics. I was alerted to their next episode yesterday and thought that you and your readers might want to know about it. Here is some information about it. Here in Northern California it is on tonight 6/30 at 10 pm, but you might want to check the local PBS affiliate to see when or if they will be showing it. I believe that PBS will make it available online to watch also after it airs. You can find more about it on PBS.org also. A report on transgender children and their parents. Included: medical interventions that are increasingly offered at younger ages. Please share this on from day on Twitter with the hashtag #LinkYourLife. Incredible read! I’m glad there still are critical / attentive readers! Thanks for this post. As adults, we’re reluctant to let young children dictate their future. Parents want to be in control, and quite rightly in some circumstances, but not this one. There was a Louis Theroux documentary on BBC Two earlier this year about trans kids (which I’d highly recommend), and remember a medical professional saying to the parents of a trans kid that ‘if their requests to transition are consistent and persistent, then they are most likely trans’. I saw that stat in the article and held tight to it – didn’t even want to question it, dig deeper – it simply is what I wanted to hear in the moment. Thanks for looking beyond the claims for all of us. I wonder, did you write to the journalist? What year is this? We have Donald Trump calling Mexicans rapists, it’s still a huge deal if a woman is a scientist, and “experts warn” that gender identity disorder is probably just a phase?? Aaaaghhhhh!!! It seems like we were a more socially enlightened nation a few decades ago 😦 But really, I am a 46-yr-old person who knew at 3 that I was transgender and that has never, ever, EVER changed. It has taken this long for me to find the courage to start becoming who I truly am, thanks to people like you Gendermom. It is much more important to follow your heart, and M’s heart, than to worry about those “experts” lurking in the pages of the NYT. Sleep well. love your animation!. so simple and fun and then details when you name and draw a specific place a really great! Well, I hardly know what to say. I’ve been quietly reading your blog for a while, nodding appreciatively, as well as a little enviously. I cannot believe how unbelievably fortunate and blessed your daughter is to have you as a mother. As someone turning 50 soon, someone who is just now figuring this all out and trying to unravel (without completely unraveling) the years of tying myself into knots to be someone I never was or will be, oh how I wish either of my parents would have understood me and supported me. What you are giving your daughter is such an amazing gift. A gift as well, to folks like me. Thank you. The NYT is not the news source it used to be. Like others of their ilk, follow the money and surprise, it’s no surprise. Gendermon: Another inspired and truly informative post. Those of us who have traveled the path of being transgender and have claimed our authentic selves know in the marrow of our bones that we are right. NO so-called science, NO psycho-social predictions, NO religious objections, NO parental restrictions and NO legal prohibitions can keep us from being ourselves. NOTHING!! M had the wisdom and fortitude to express herself to you and you had (and will have much more) wisdom and fortitude to support her and love your daughter. Please know that you two and your family and friends have my full support through life’s journey AND how exciting and wonderful it all is. First I want to say that I am a clinical social worker in private practice. As a generalist I am rather adverse to being identified as a specialist of any sort. I was rather surprised that I was approached by a mother to begin treatment for “gender dysphoria” on her trans-daughter (age 8). I did an assessment and said “This isn’t gender dysphoria, this is gender expression.” My professional association has stated that gender expression is a choice and I agree. I explained this to the mother and we began problem solving to identify risk factors and problems in her daughter’s life. Essentially the anxiety that her daughter felt was in regards to “coming out” as a girl. I am by no means an expert and I explained this to both my client and her mother. However I went back to my references, and continually I was just made aware of the fact that this mother, who supported her daughter’s choice, and this girl had no identifiable problem. I am continually dumbfounded at the ease this child talks about her feelings that many adults struggle to articulate. Currently we are in “surveillance mode” and check in to see how my client manages her relationships and her world. If anything I am learning more from her than she does from me. I did tell the mother as her daughter encounters people and discloses her transgender identity that many adults will be challenged. Their own particular feelings in regards to gender, sexual identity, and preference will bubble up and may even be projected onto my client. We handle those things as they come. She has lost friends. She has gained allies to this day she is authentic and true to who she is and how she feels. I hope this is received by those that need to hear a success, and maybe those who don’t know that there are allies out there. What drives me nuts (OK, *one* thing that drives me nuts) is that even when you do get an actual citation or PUBMED link, all that we mere mortals can see is the abstract. To see the full text of the article, which includes minor things like the study design, the methodology, and the actual data — it typically costs $30-50 for a single article. Sure, you can look it up at the nearest university library that subscribes to the journal — if you have the time and the resources to do that each time. The system is rigged so that the average person either doesn’t have, or has very limited, access to the actual published science.